I'm always on the lookout for new eyeshadows. No matter how many clutter up my vanity, it seems I can never have enough! 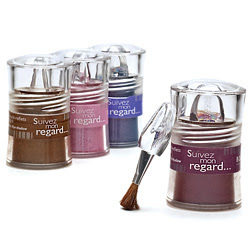 But one I keep going back to again and again is Bourjois Paris Suivez Mon Regard. But my favorite part is the packaging. Each shade comes in a miniature pot complete with its very own tiny brush -- perfect for sweeping on just the right amount of shimmer before heading out for an evening on the town. C'est magnifique! Note: Unfortunately this product is no longer available.